One of the important components of family research is piecing together a narrative that describes the family and its changes throughout time. 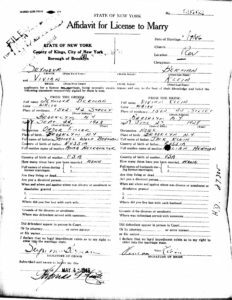 This is a living document, so I will continue to update this page as I discover and learn more about the family. I’ve traced the family of my mother, the Bermans, back to Wolf Berman, who was born in Russia. He married Feige Slawitz (Fanny) about 1890, before she immigrated to the United States. 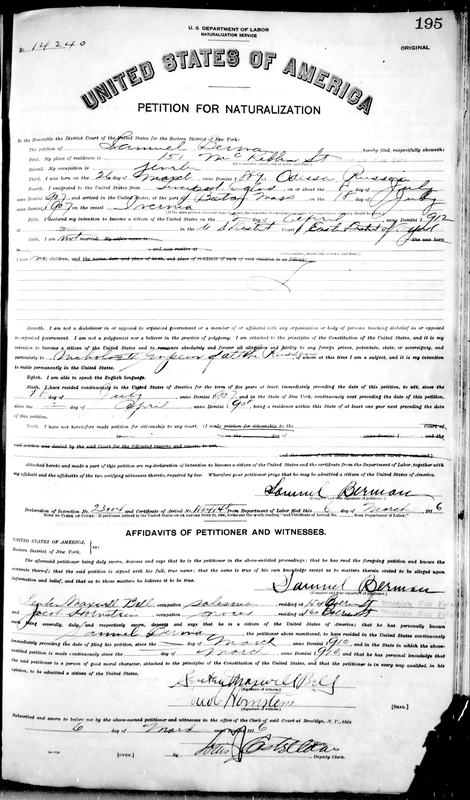 Feige first appears in the U.S. federal census in 1910, by which time she is a widow, living in Brooklyn. She arrived in the United States in 1907 or 1908, and she had eight children, only one of whom, Samuel Wolf(e) Berman, had survived by 1910. Feige’s parents were named Joseph Slawitz and Malke (Molly) Ginsburg. Samuel Wolf Berman was born in Odessa (present day Ukraine) on 26 Mar 1899. He left for Boston, Massacusetts from Liverpool, England, in July 1907. He appears to have traveled with Aaron Labunsky, under the name Schmuel Berman. Aaron and Samuel were listed in the ship manifest as cousins. Both were expected to be received by Odella Labunsky, Aaron’s sister. At the time of his immigration, Feige was still living in Slawuta, Wolinien (present day Ukraine). I haven’t found any convincing evidence of Odella or Aaron in Boston. By 1910, Samuel was living with his mother in Brooklyn. Samuel declared his intention to become a citizen of the United States in 1912, and the process completed with his naturalization in 1916. He married Anna Nachamin (Neckameyer), the daughter of Wolf Nachamin and Rebecca Kashowitz, on 22 Mar 1919. Continuing their residence in Brooklyn, Samuel and Anna had three children: Aaron W. (Al) born in 1920, Seymour (Cye) born in 1923, and Rita born in 1928. Samuel passed away on 26 Apr 1938. Aaron married Estelle Amanda (Pat) Lovejoy, and later passed away in November 1983. They had three children. 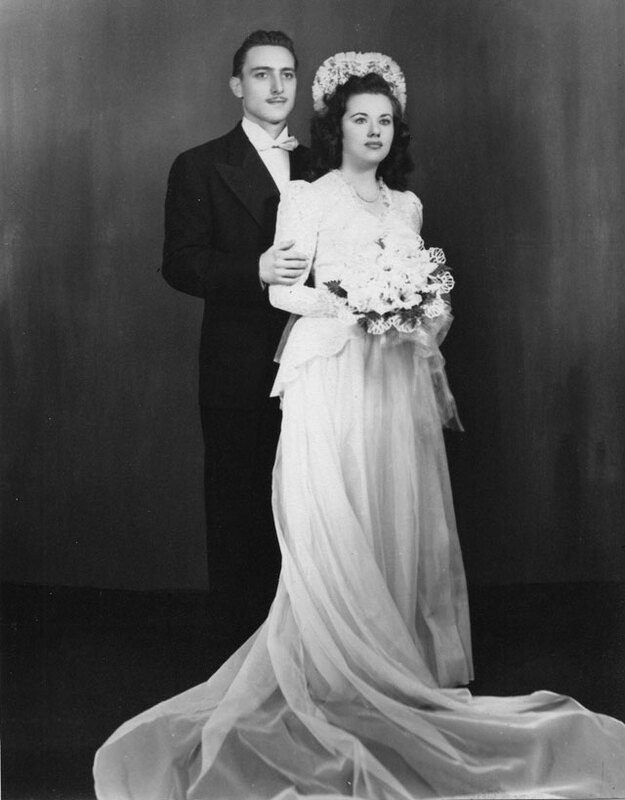 Seymour, my grandfather, married Vivian Klein, daughter of Jacob (Jack) Klein and Lillian Herman, on 19 May 1946. Seymour passed away on 16 Jul 1978 in Suffolk County, New York. They had two children. Rita Berman married Lawrence Abrams, and later passed away on 17 Jun 2010. They also had two children. After Samuel Berman passed away, Anna Nachamin Berman remarried several times. She married Benjamin Rich, who appears alongside her in some of these home movies. After Ben died, she married Max Vogelfanger. Max later passed away, and Anna moved to Florida before passing away herself. Harlan, Aunt Rita passed away in June 2010. Is Wolf spelled Wolfe? Nancy (Estelle’sgrand daughter). Hi, Nancy! Thanks for the info! I’ve seen lots of variations of the “Wolf” spelling on the Berman side, from Wolff to Wolf to Wolfe. I don’t have a lot of first-hand accounts, though. 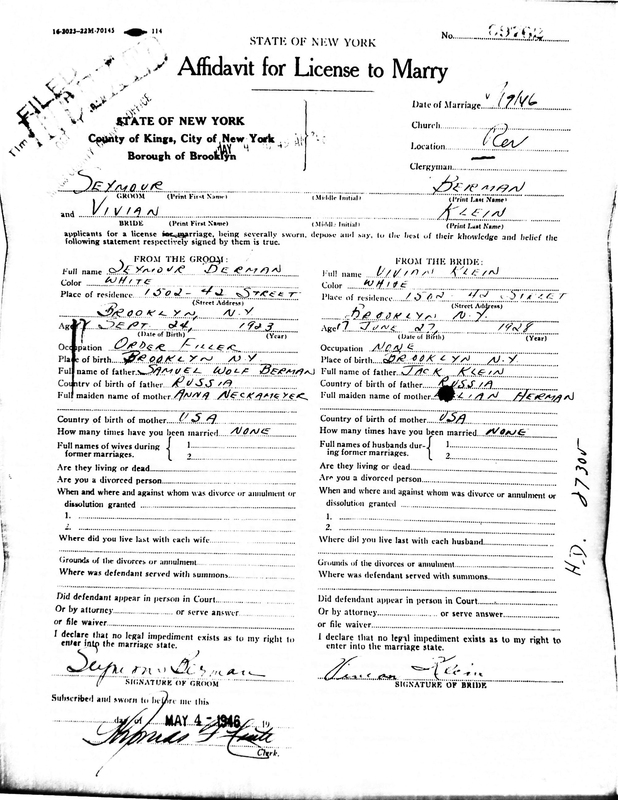 With the Bermans still around today, it’s easy to see how they spell their names, but for those who have passed, I’ve been relying on documents like death records and census records, and you can never be too sure if the person taking the information was spelling the names the same way they spelled them in the family. Wolf as a name came to English through Yiddish, and there was no uniform way of spelling Yiddish words in English. Even though wolf is an English word, there was a lot of freedom in the way names were spelled, and until the late 19th century, European Jews just weren’t too concerned about name spellings, whether in Yiddish, English, or their town’s language. If you have any old documents where Samuel Berman or Aaron Berman signed or spelled their full names, those would help to confirm how they spelled their middle names. Harlan, Wolfe is spelled with an ‘E’. Samuel (Uncle Sammy) has three children. David Wolfe, Aaron Wolfe, and Katelynn. David has a son Michael Wolfe. I am hoping the name does not die out. It is such a strong name. Thanks, Nancy! I’ll update the spellings. Hi Harlan, I think we’ve messaged via ancestry…just came across this blog…how did you determine you Wolf traveled under the name Shmuel? I’m searching for my Wolf Berman whose father was also Shmuel, or his name could have been Wolf Shmuel. On a birth cert for one of his children he’s listed as Vol’ko. Wolf married an Anna as well. DOB around 1860ish. Where are your Bermans from? Hi Tina! It was Samuel who was listed as Schmuel in the ship manifest. Fannie was possibly living in Slavuta before immigrating to the United States. Samuel might have been born in Odessa. Also I posted a pic in TTT of a Feige Berman and son Sam Berman. Check to see if its yours. What I have in the Samuel’s bible is Anna’s father’s name was Wolf Neckameyer Was named Wolf no (e). My son David was named after him Wolf no (e). Hello. I am trying to find some answers as my family has been quite enegmatic. My father was adopted by his mothers 2nd husband (who was Christian) and there was little discussion about my “Jew” ancestry. My Grandmothers maiden name was Dobozin (first name Helen). All I have heard about my fathers background was that his birth name was Berman. He was born in Buffalo. 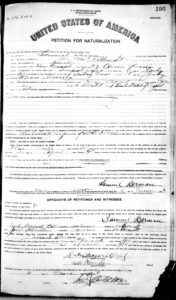 Being that he was adopted – I cannot research much further. Since I have no details, I am hoping that others who have searched can help me fill in the gaps. I’d love to know more about my roots and be able to offer a history to my children and grandchildren one day.